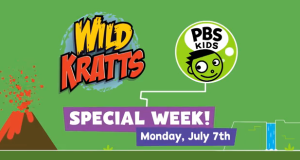 New WILD KRATTS special to air Monday, July 7! On Monday, July 7th, PBS KIDS will premiere WILD KRATTS: BACK IN CREATURE TIME, a one-hour special of the popular series, WILD KRATTS! New episodes of WILD KRATTS will premiere throughout the week of July 7th as well, please check your local listings! A second WILD KRATTS special, WILD KRATTS: SWAMP THINGS! will premiere in two weeks on July 21. 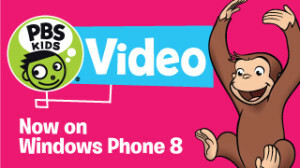 PBS KIDS Video now available for Windows phone! The free PBS KIDS Video App features thousands of videos from top PBS KIDS television series, including Curious George, Daniel Tiger’s Neighborhood, Wild Kratts, Peg + Cat, and Sesame Street, and also includes resources just for parents. The app also launched this week on Android and Chromecast. Global baby brand, aden + anais, has joined forces with (RED) to fight for an AIDS Free Generation with the launch of the (aden + anais)RED Special Edition Collection. Featuring a stylish line of boutique muslin baby products in fun (RED) prints, the new (aden + anais)RED collection allows mothers to make a smart choice for their babies while also helping mothers across the globe. Founded by mother and entrepreneur Raegan Moya-Jones, aden + anais was born out of a mother’s need to care for her baby. In just seven years, the aden + anais brand has become a trusted favorite among consumers, supporting parents in over 63 countries worldwide. And, through its new partnership with (RED), aden + anais is now taking that support one step further. 10% of every (aden + anais)RED product will help support the Global Fund to fight AIDS and its critical work to reduce the number of babies born each day with HIV. 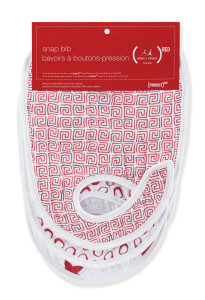 Available at adenandanais.com and at key distributors in the USA, Australia, Canada, Japan, and Europe, the new (aden + anais)RED Special Edition Collection includes a four-pack of swaddle blankets ($49.95), a two-pack of swaddle blankets ($32.00), a three-pack of snap bibs ($19.95), a two-pack of burpy bibs ($22.00), a dream blanket ($49.95), and a three-pack of Musy Mates ($19.95) (Europe only). To date, (RED) has generated more than a quarter billion dollars for the Global Fund to fight AIDS, Tuberculosis and Malaria, to support HIV/AIDS grants in Ghana, Kenya, Lesotho, Rwanda, South Africa, Swaziland, Tanzania and Zambia. 100 percent of that money goes to work on the ground – no overhead is taken. Global Fund grants that (RED) supports have impacted more than 40 million people with prevention, treatment, counseling, HIV testing, and care services. Self Disclosure: No compensation was received to post.